Civilisations and their governments have always sought to provide urban transportation systems that enable citizens to get from A to B with minimum fuss. But thanks to a new wave of technological innovation, Smart Cities are set to achieve higher levels of transport safety and efficiency than previously thought possible; and the University of Adelaide is one of the movement’s key drivers. Led by the Centre for Automotive Safety Research (CASR), the University has numerous multi-disciplinary research teams developing opportunities to improve virtually all aspects of urban transportation, as the following examples indicate. Among CASR’s most significant current projects is the creation of a low-cost, laser-based traffic monitoring device that promises to enable detailed studies of entire road networks’ functioning. According to lead researcher Dr Jamie Mackenzie, a research fellow at the centre, the roadside-pole-mounted device will enable the gathering of valuable, potentially life-saving data with unprecedented flexibility and affordability. “A fully developed device that’s affordable enough could be deployed en masse across a city’s road network and enable large-scale monitoring,” says Dr Mackenzie. Another high-tech device recently designed and developed by CASR researchers attaches to bicycles and measures their distance to passing vehicles, while also tracking the bike’s location and speed. Dr Mackenzie, again lead researcher on the project, says the device will deliver crucial information on how vehicle passing distances change in relation to factors such as speed limits or the presence of a bicycle lane. 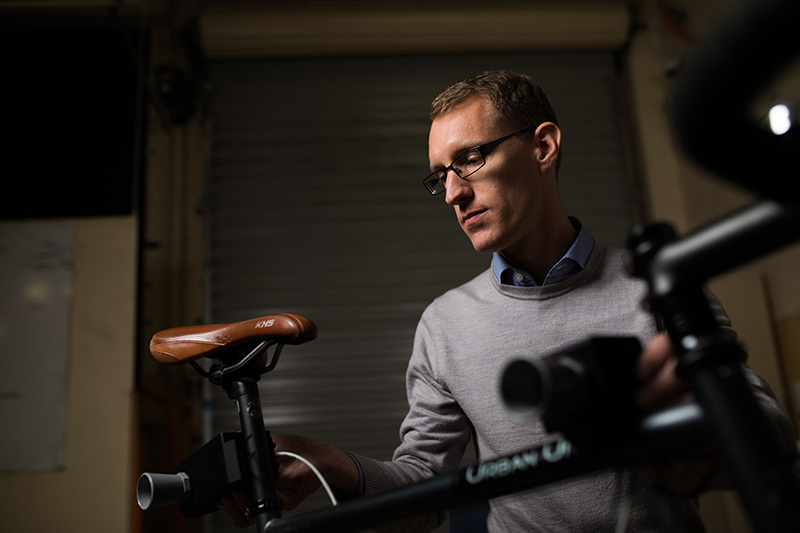 Also in the area of cycling safety, the University’s Australian Centre for Visual Technologies (ACVT) has developed video-analysis software to detect and count cyclists on the road, rank their visibility and gauge their speed. The software, initially developed as a pilot for the South Australian Motor Accident Commission, could allow authorities to determine cyclists’ exposure at particular points in traffic networks without having to install specialised counting systems. Demand for the technology is strong, adds Dr Szpak, but the software’s specialised nature means continuous use is not yet feasible. With this in mind, the ACVT is now working with CASR to adapt the approach for use with licensed software. With modern vehicles adopting increasingly advanced technology to assist drivers and improve safety, CASR is developing similarly advanced testing equipment to ensure manufacturers’ performance claims can be replicated in real world, Australian conditions. The equipment consists of custom-built robots that manipulate the steering and foot pedals of test vehicles to accurate tolerances. Foam vehicle targets are then attached to electric karts, which interact with the test vehicle in various scenarios, and if a collision occurs the foam target collapses safely and can be rebuilt for the next test. The equipment could also play an important role in assessing autonomous vehicle systems and reconstructing autonomous vehicle crash scenarios. This entry was posted in Engineering, Impact stories, Smart cities, Societal Wellbeing. Bookmark the permalink.